I’ve always loved that quote, even though it portends dark times will be had in those hallways. I know some people actually say it’s hell in the hallways. And we should try to get to the next door lightening fast. You see, if I’d rushed through the dark hallways I might never have discovered that what I thought truly mattered to me didn’t matter so much after all. Or worse yet, I wouldn’t have stumbled upon that secret door (covered with cobwebs) that once opened revealed brilliant shafts of light and special treasures of meaning and joy. Yes, there is always light in the dark. And dark in the light. So I say let’s all slow down a teensy bit and let our eyes adjust to the darkness. 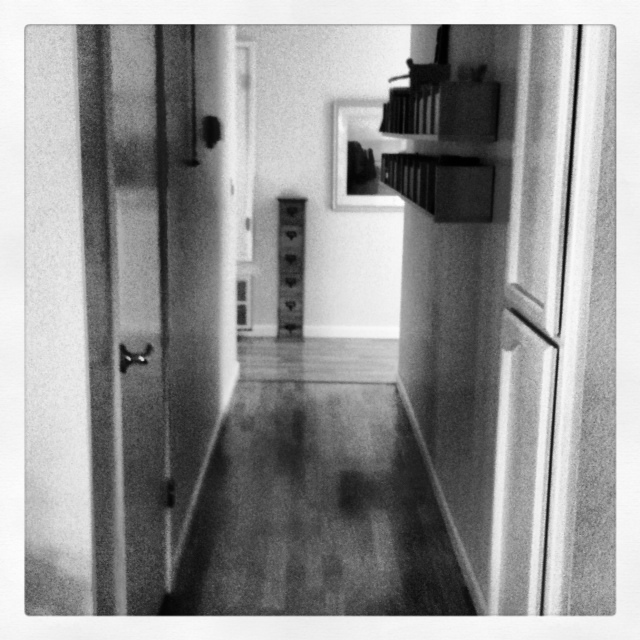 Then take a leap of faith and enter the hallway with deliberation and curiosity. And trust that even though it’s dark and scary in there, there’s something meant just for us to discover in our hallways. If you’d like monthly resources for Living Deep (and getting through those hallways) delivered straight to your inbox, subscribe here. Thanks! Definitely with you. Along the same lines, this thought came into my head yesterday: thank God for everything that crosses your path, the good and the bad. I’m attempting to do this. I suspect it may be life-changing if I can get in the habit! I always love your comments, Charlotte. I feel like we’re sorta sisters on this journey toward life-changing habits and practices! We are so sisters, feeling our way towards these new practices. It helps so much to have others along on the journey. I am with you on this as well. There is much to be learned in the hallway and the joy behind those doorways is so much brighter when held in contrast to the dark. I also agree with Charlotte…gratitude has the power to transform our lives. I so appreciate you thoughtful, insightful posts, Patty. Thank you. Thank you, Janice. I so appreciate your thoughtful comments. And that thing about contrast…so much of the essence of life, I think. Totally with you! I think it’s in that hallway where we are given the opportunity to let our inner light guide us! Yes! You said it perfectly, SuZen. hugs! there are always treasures in the dark hallways (or tunnels, always my metaphor). Lovely post. Sharing over on FB. thank you! Mmm, love that metaphor of tunnels, Tammy. And thanks for being here! Yes, I like the realism of that view — that change — or, at least, the type of change that matters — is going to take place gradually, no matter how we may try to accelerate it or avoid it. Although it sounds depressing on the surface, one of the greatest things I can do for myself is to give up hope that I’m going to be different — and once I let go of the need to be someone else I can actually start appreciating where I am. Thank you. I needed this today. I have a very good friend who’s going through a scary medical procedure. This reminds me to look for the light…to expect it to show up once I’ve adjusted my eyes to darkness. My thoughts are with you Sara. I know the waiting is hard.